In my husband's vocabulary, a "Mango break" means starring into the thin air for at least 15 minutes. while i make the "Mango tour of the day". 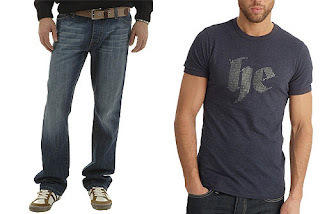 But this scenario is no longer true, considering that the new HE collection caught his eye and his interest. And they sure caught my eye as well. The 46 items collection has a strong urban, rebel feel. Lots of t-shirts, some of them in vivid colors, other with subtle rock and roll details. My favorite: a lime t-shirt with the simple word HE written in the front. 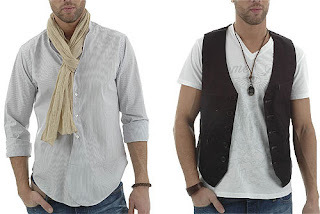 Bohemian looks includes several vests, to be worn over shirts. And speaking of shirts, i bought by husband the perfect white shirt, with long sleeves and a small white logo at the bottom. Other shirts are available as well, in different styles: tunics or shorts sleeves with stripes. The accessories department is quite generous for a man's collection. Lots of shoes (sneakers in neutral colors and beachwear as well), sunglasses (aviator style) and some bags and luggage and wallets that seem very interesting to me. 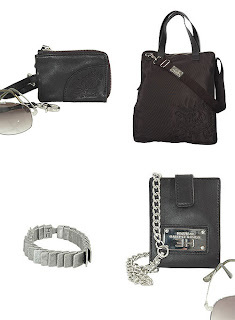 Scarfs, belts and rocking metal bracelet finish this selection.